Rainbow Joy House is a perfect accommodation for small group! Enjoy the cosy and quality lifestyle! Also a perfect stay for corporate booking! 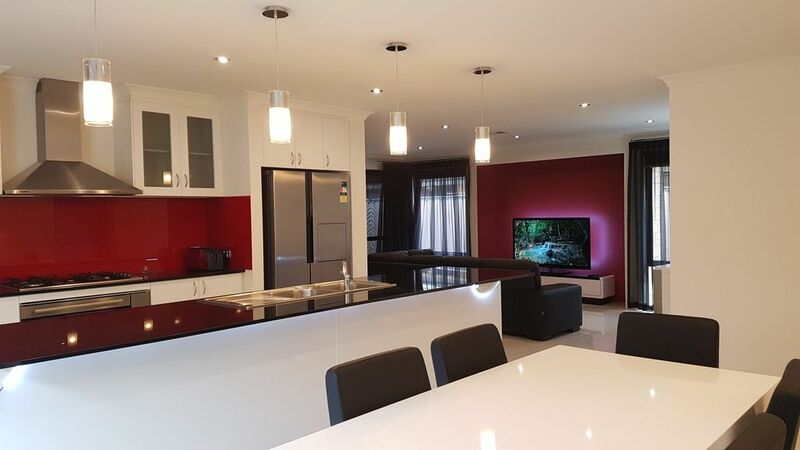 The house is located in a very convenient location that is close to the Perth International Airport, Perth CBD, and within only few minutes drive to major shopping centers around the area. There is also local cafe and oriental shops that are within walking distance from the property! Rainbow Joy House is a modern built design house with a premium lifestyle that is sure to enrich your staying experience and live like a truly unique local lifestyle! The house has 3 bedrooms, 2 bathroom with 3 toilets. Enjoy the quality and luxurious furnished property. Large and open living spaces gives you the unprecedented holiday experience, with Large TV entertainment with easy access to online movies/documentaries channels. At the rear of the property, you are invited to truly relax at the large decking area with very comfortable outdoor sofas, great for a small gathering for a nice coffee time! ** For longer stay of over 1 month duration stay, welcome to enquire within for a special rates. We also welcome holiday work guests from overseas with a valid working visa. Rainbow Joy House is close to Perth International Airport, and located in a serene and quiet residential area. There are parks around the area, and convenient access to shopping centers, restaurants, and highways to any other part of Perth. We enjoyed our stay in this house with its vibrant warm colours. Love the space compared to staying in a hotel room and the decoration. Will stay there again in future. Thanks Ambrose, your property is very clean and is very well presented! You have been a pleasure to deal with, I would definitely stay in this property again. An excellent property to stay in. Quiet location and the hosts are very helpful. My family loved this cozy comfortble property. shops around but not a large choice,the nearest supermarket is a 10minutes drive. My family and I had a wonderful stay in this house. It was very new, clean n basically provided all the essentials we needed. Our hosts, Ambrose and Olivia, were very hospitable n helpful. We were delighted to find some light snacks upon our arrival at their home in the wee hours of the morning. They were also kind enough to accommodate our late check out because of our late flight departure time. Thank you for being so generous! We would certainly recommend this house to our friends!